Purity Rings for girls and women are a statement of your belief and commitment to another person. 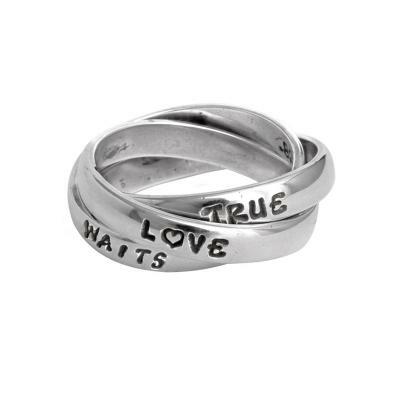 Personalize your triple purity ring to create your own piece of meaningful christian jewelry. Purity Rings for girls and women are a statement of your belief and commitment to another person. Nelle and Lizzy will create your personalized purity ring by hand-stamping a word, a bible verse, a phrase, or any other symbolic statement of your faith to create your own piece of meaningful jewelry. Be creative ~ you can put one word on each band or divide a phrase and put different parts of the phrase on each band. My daughter loved the ring! I give you 5 stars... the ring, as well as the packaging, is absolutely beautiful! Thank you so much, and have a happy and blessed new year!